Even if you don’t “beat” top competition every time, facing top-notch foes is the best path to self-improvement. That was the theme this past week, as the Boone Central/Newman Grove wrestling team faced some of its toughest competition of the season in Tuesday’s Aurora Quad and the Central City Invite held Saturday. 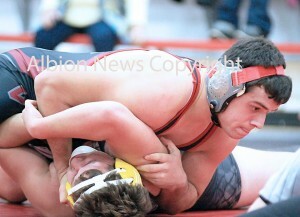 Although the Cardinals did not have their best results of the campaign, Coach Dale Bonge said his wrestlers would benefit from the experience. BC/NG began its week at Aurora, placing fourth in a close, competitve and intense quadrangular meet. “For a four-team meet, the competition was as tough as we had seen all year. Amherst is the six-time defending Class D state champs and rated #1 again this year. Aurora and Beatrice are very solid Class B teams,” Bonge stated. “We welcome wrestling good competition, because you aren’t going to improve very much if you compete only against a soft schedule. As weather played havoc with the scheduled High Plains Invite this past weekend, Boone Central/Newman Grove switched gears and competed in the Central City Invite Saturday, placing ninth. When the team that won Tuesday’s quad slugfest finishes a fairly distant third, it’s evident the competition was stout.